Buy logs from one of the UK’s favourite log suppliers. We provide a fast delivery service for seasoned logs delivered next day across the UK. Our easy-to-use sister website Online Logs allows you to buy logs online with ease. Simply click the ‘Buy Logs’ image below to visit our specialist log supplier website. On our log suppliers website you can purchase a number of different products. 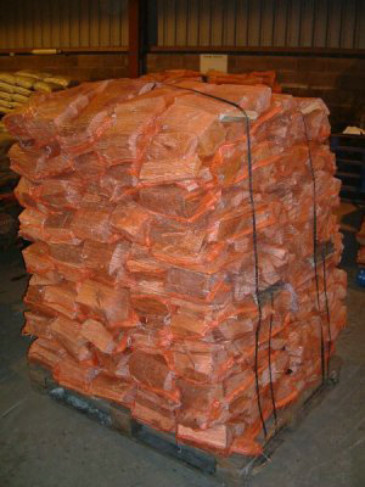 We supply logs in one cubic metre bulk bags, on stacked bulk pallets and in smaller netted bundles. The most economical way to buy logs is to purchase our stacked bulk pallet of split logs.As one of the leading log suppliers in the UK we provide high quality logs to create the perfect open fire. We supply logs to both domestic and trade customers, with no minimum order. Unlike other log suppliers, we are happy to cater for small or large orders. A stack of 80 nets ready for delivery, one of the best value quantities.